Today was a pretty laid back kinda day so I don't really have much news. As we are departing Katherine tomorrow morning I spent quite a bit of the day preparing for the next few days. We will probably be spending the next few nights where we won't have electricity or phone/Internet coverage. So I have to make sure we have food to eat and the van is prepared for the journey. On the nights prior to heading off from a location we have spent some time in we like to actually go out for dinner on our last night. 1. We can get organised for our departure without having dinner stuff to clean up and 2. Its just nice to go out somewhere. Although not all locations have somewhere to go. But Katherine does and we headed out to the Chinese Restaurant and had a very nice meal, although I think I ate to much!! 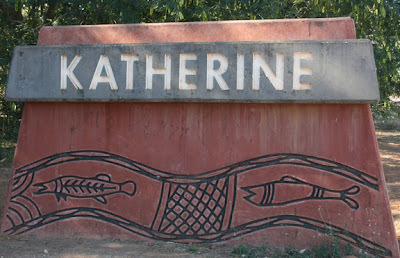 I have really enjoyed staying in Katherine, the caravan park is very nice and clean and Katherine Gorge is spectacular. But in my opinion Katherine doesn't grab me as a place I must return to. But then that's only my opinion. That's good you go out for dinner on your last night in an area, like you said less work and then you can just kick back and relax. 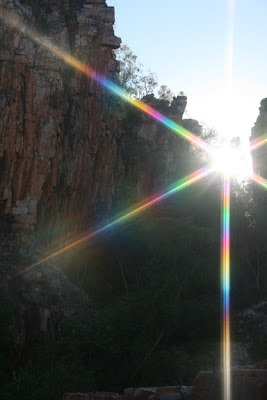 Did you have a star filter on your camera for your Gorge shot? It looks pretty awesome! Yes Darlene it was a star filter.I was happy with the result as well. I like hearing about the 'practical' aspects of your adventure, Davine. The caravan park recommendations are great! I also wondered at the challenges of setting up 'home' in places which don't have what we would consider 'essentials' like electricity. I'm not sure how I would go with that! Look forward to hearing about the next adventures. Thanks for sharing!! Thanks Michelle - you sort of get used to not having electricty.